There are so many shoe storage options on the market, yet they all won’t work for everyone. Every home is different, person’s preferences vary, and every situation is unique. 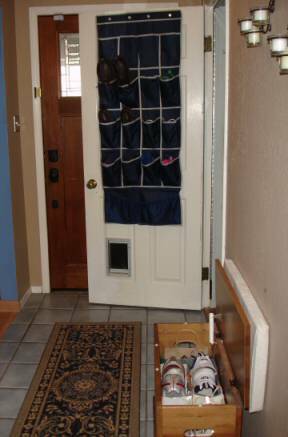 Here is how I solved our cluttered shoe problem in the small entry area of our home. Imagine this area with shoes strewn about. They come off people’s feet and sit there, blocking the walkway. I bought a nice two shelf, faux wood shoe storage rack to put our shoes on. 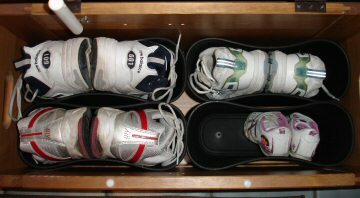 It helped give us an area to store a pair or two of our most worn shoes. 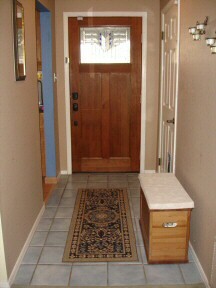 However, it took up walking space in the entryway and it always felt a little crowded. Not to mention, extra shoes were left in the area, on the floor or piled on top of the other shoes and the problem looked even worse. Some time ago we had bought this bench to sit on when putting our shoes on and off. We needed something smaller than the average shoe bench on the market. Turns out, this is a file cabinet from Ikea! It’s super sturdy and on wheels with a padded top. Perfect!! I decided one day that I couldn’t stand the shoe clutter in the entryway any longer. I decided to use the space INSIDE the bench. I thought that perhaps I could find a way for us to all keep at least one pair of our favorite shoes in the bench. How to organize them? I envisioned nice rectangular plastic tubs to drop the shoes into toe first, but that wasn’t going to happen that day. Instead, I sorted through all my gift bags I had stashed away. I found a few nice sturdy ones I saved from shopping at nicer stores (thick paper with handles). I was able to fit five bags into the bench allowing me to sort and store five pairs of shoes perfectly! It has worked out very well. 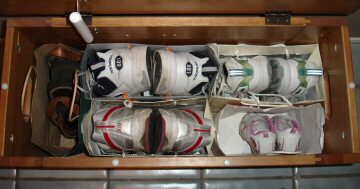 The kids can open it and reach in to get their shoes, and they’re able to put them away easily too, with a little coaching. I was so happy! Convenient shoe storage without seeing the shoes, AT ALL! Recently on a trip to the local dollar store I found some small rectangular trash cans. They fit in the bench very well. There is only enough room for four pair of shoes instead of five, but they are plastic so they’re more durable, water proof and easy to clean. Though, the bags were holding up pretty well. I know that every house has its own layout and every person has their own storage needs. Hopefully my solution may spark an idea for you, or get you to think outside the box (or inside the box in my case). Be creative and don’t limit yourself!